Have you ever gone on a cruise? Well, Chato and Novio Boy did. In Chato Goes Cruisin‘ Chato was eating and he found an offer. It said win a cruise for two. Three weeks later Chato shouted, “we won a cruise for two!” Chato and Novio Boy got ready. The first night on the ship they served dog food. They tried to sleep but it was too loud. On the third day, the dogs were sick. They found vets for them. Chato said, “there are too many sick dogs.” Chato and Novio Boy saved the day. Then, Chato found a second offer. Where do you think they are going to go next? I like the part when Chato and Novio Boy saved the day. I like this part because I like super heroes. Chato and Novio Boy were acting like super heroes. I recommend this book to people who like Gary Soto books. 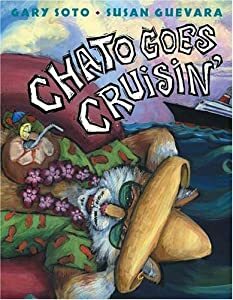 I recommend this book who like Chato books, or to who like cruising. I also recommend this book to kids who there age is 8 and up.